“Build a wall! Build a wall” shouted the crowds during candidate Trump’s campaign rallies. This was one of his primary elections promises. Candidate Trump’s supporters were excited to have him simplify the world for them. As voters who are frequently disappointed by politicians not living up to campaign promises, we think it is good that a politician would deliver on his promises. What is unique about President Trump’s promise to build a wall is that it is built on hyperbole and divisiveness that is unprecedented in its demonization of minorities. And everyone knows walls don’t work. The country has problems with drugs and illegal immigration. Instead of dealing with the pull and push factors of immigration and the demand side of the drug problem, we should just build a wall. President Trump wants to run again. It is very important for him to keep his base excited and happy. He wants to deliver o this electoral promise no matter what facts and sound policy dictate. It does not matter if anyone can climb over the wall, dig under the wall. The wall is needed. It is an emergency. A re-election campaign emergency. 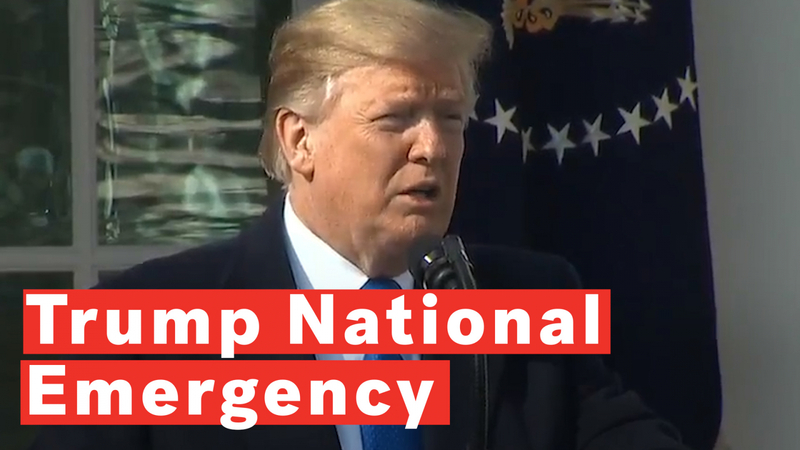 The question today is, is there a national emergency? The Congress passed a law years ago giving the President the authority to use funds from certain accounts for emergency situations. The President is the one who determines the presence of an emergency. An emergency is not a catastrophe as some like to imagine. Democrats are upset because the resort to the emergency funds is an end run on them. Republicans are worried that Trump is setting a precedent for future Democrats to raise the emergency funds for to advance agendas that Congress is against. The matter might end up in Court. The Supreme Court has been protective of the President’s foreign policy powers. It is highly likely that the current Supreme Court, dominated by conservatives, would uphold the president’s use of emergency spending power. But the question is do we have a national emergency? The answer is yes. But it is not at the border. Despite the fact that the nation is the richest it has ever been in history, we have a massive rise and increase in inequality. Democracy is not sustainable in a country with inequality. The numbers speak for themselves. We have the decline of marriage. People are getting married, but not the poor. Life expectancy is declining. Suicide rates are up. So many people are dying from opioid overdose. University students have to borrow so much to study because states keep cutting their funding of colleges. College graduates owe more than a trillion in student loan debt- 1.53 trillion. That’s a massive amount of debt. It affects the country in so many ways. Massive student debt leads to decisions to delay buying a house, getting married and having children. We do have an emergency. The US has 21 federal social welfare programs that help almost everyone in the country. However, these programs have not been able to reduce the rising gap in income. Even liberal economist Robert Reich and conservative political scientist Charles Murray, polar opposites on policy, agree that the income inequality in the US is at a dangerous level for a democracy. They both agree that the US should have a guaranteed minimum income. As a nation, it would have been great if we had a national emergency that would be fixed by simply having a wall. But it is not. We do have a broken immigration system but that white elephant of a wall will not fix it. The true emergency is so many lost lives and so many lives on hold due to our massive income inequality that is literally killing our citizens and holding back so many citizens from living a full and fulfilling life. Rising suicides, rise of hate crimes, the increase of gun violence, the lack of universal healthcare, homeliness, the increased rates of crime and the jammed prisons cells and domestic acts of terror, and the declining life spans. That’s our national emergency.